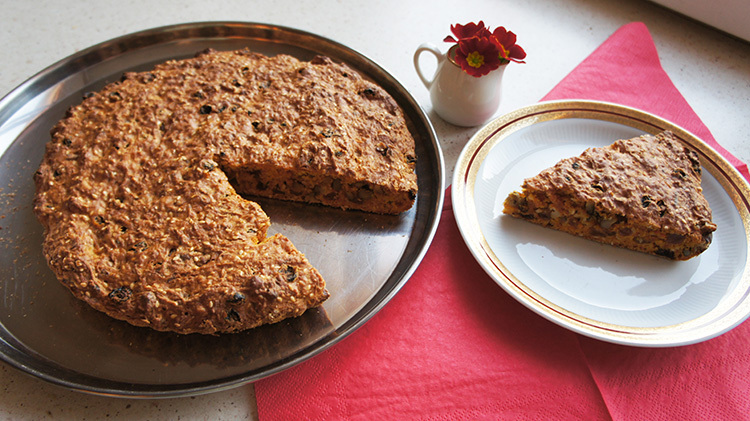 A great versatile fruit and nut cake with carrots and raisins. Wash the carrots, peel, and grind with a fine grater. Add sugar and leave for a few minutes until the carrot juice appears. Add baking powder, sugar, and flour to the carrots and stir to form a batter. Mash and grind nuts to desired size. Add washed raisins, sesame seeds, nuts, and stir again. Sprinkle with bran semolina or flour on to the baking dish. Pour the batter into a 25 cm baking tray. Preheat the oven to 392 °F or 200 °C for even top and bottom heating. Insert a toothpick or a skewer into the center of the cake, it should come out clean, if not bake for a further 5-10 minutes and check again.